When it comes to luxury, Dove Mountain real estate does it best. Nestled in the Tortolita Foothills, just north of the hustle and bustle of Tucson, is a community of custom estate homes. Residents enjoy the best of Tucson’s nature scene with over 6,000 acres of breathtaking mountain views. Prospective homeowners are invited to take a closer look at what the Dove Mountain real estate market has to offer. Imagine yourself entertaining a houseful of neighbors and friends at your annual summer BBQ. There is no custom home more gorgeous and apt for hosting than the Hacienda. Floor plans boast a 4,100 square foot home that features three to four bedrooms, retractable glass walls, and a private courtyard. Treat your guests to maximum comfort with a private suite and separate bath or host brunch in your morning room that overlooks Tucson’s mesmerizing desert landscape. Casita with bath totaling 624 square feet to be used as a guesthouse, private studio, home gym, or even a rental property. Though the architectural style will dictate the home’s look and feel, all Hacienda homes include its most sought-after feature—the great room. Situated in the heart of home, your great room will be ideal for unwinding after a long day or chatting with friends who pop by to say hello. Past the main entryway is a private courtyard with views you’ll enjoy through retractable glass walls. Sip tea under a patio umbrella or tend to your flowerbed—your outdoor space will transform the way you relax. Choose between four bedrooms or three plus a den. Hacienda homes come standard with three bathrooms plus a powder room for freshening up after a dip in the pool. The master suite features a spacious closet, separate master bath, and cozy fireplace. It’s located in a separate wing with direct access to the pool and patio. Speaking of the outdoor space, all luxury Dove Mountain real estate homes capture the natural essence of Tucson’s desert sanctuary. Listen to the coyotes howl or doves coo as you sip red wine from your outdoor kitchen. Dip your toes in the pool and watch the sun set over the mountainside. When you live in Tucson where the sun shines 350 days a year, your backyard is just as important as the home’s interior features. Dove Mountain real estate does not compromise on either. Are you getting the most out of your custom home? 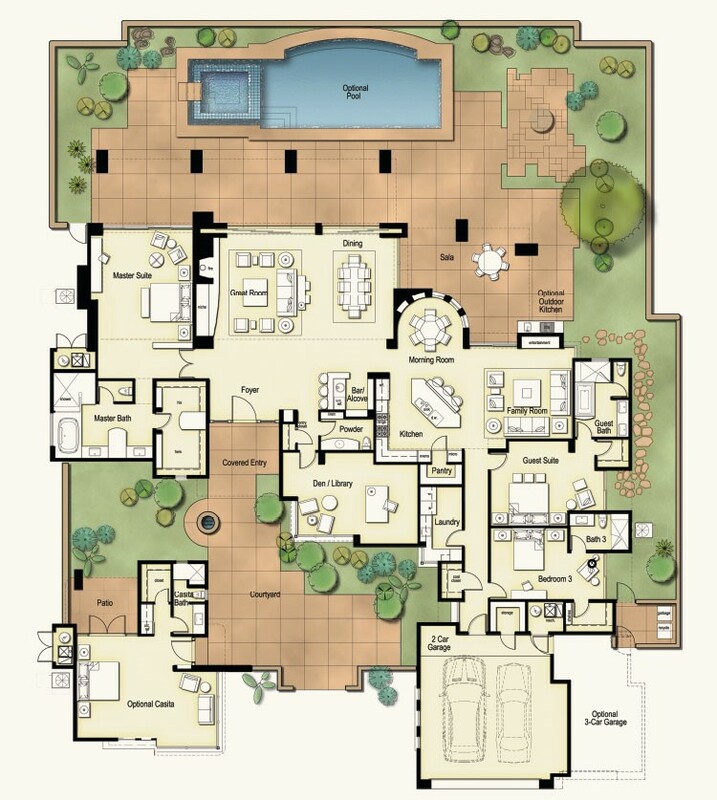 Luxury Dove Mountain real estate gives you more than a spectacular living space. Just outside your front door, you’re treated to an award-winning golf course and club house—the latter of which caters solely to members with exquisite dining, fitness centers, indoor and outdoor private event spaces and lighted tennis courts. Not into golf? Dove Mountain’s vast acreage gives way to a multitude of other outdoor activities like horseback riding, running, cycling, and hiking. The city of Tucson is rich in history, architecture, regional dining, and art. There is never a shortage of things to do from annual festivals to day trips and casino nights to private tours. The Old Pueblo is truly the best of both the urban and rural worlds—with either experience available at the changing of your mood. For more information on luxury Dove Mountain real estate properties to include current pricing and availability, contact a real estate professional or call 877-451-7205.